Buffet options include one soft drink per person. All dinner entrees are served with one compliment, one dessert and a soft drink. COMPLIMENTS: (Choose One) Baked Potato, Loaded Baked Potato, Mixed Steamed Veggies, or Garden Blend Rice Pilaf. DESSERT OPTION: (Choose One) Raspberry Cheesecake, Carmel Apple Pie, Chocolate or Vanilla Cupcakes, Buckeye Brownie, Red Velvet Cake, Carrot Cake, Key Lime Pie, Chocolate Peanut Butter Cream Pie, or Cheesecake Bar with Assorted Toppings. All prices subject to 18% gratuity and 8.6% tax. Grilled salmon filet cooked to perfection and topped with light seasoning. Tossed Lettuce Salad with Dressing or Caesar Salad. CHOOSE ONE PASTA: Chicken Alfredo, Seafood Linguine or Veggie Marinara. 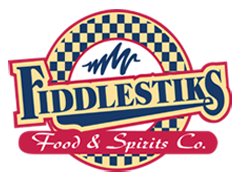 Fiddlestiks. Add Fresh Baked Cookies & Cupcakes for 10.99 per person. Minimum 15 people. Serves 15-20 people. Toppings: Cranberries, Candied Pecans, Shredded Monterrey Cheddar Jack Cheese, Diced Eggs, Almonds, Strawberries, Pineapple, Mandarin Oranges, Tomatoes. Add grilled or fried chicken $4.99 per 8 oz. CAKE CHOICES: White, Chocolate and Marble (half and half choice can be made for half sheet cakes and full sheet cake sizes). ICING CHOICES: Butter cream frosting, satin icing (cool whip). Prices include cutting and serving cake.